Actions against slumlords on East Hastings heated up today as tenants and community supporters led a picket line in front of the Brandiz Hotel (122 E Hastings) today. This is the latest in a series of escalating actions against “the Sahotas,” owners of several notorious Downtown Eastside slum hotels including the Regent, Balmoral, Cobalt and Astoria hotels. Last month, tenants of the Regent launched a class action lawsuit against the Sahota’s and the City of Vancouver for failing to make critical liveability and safety repairs. 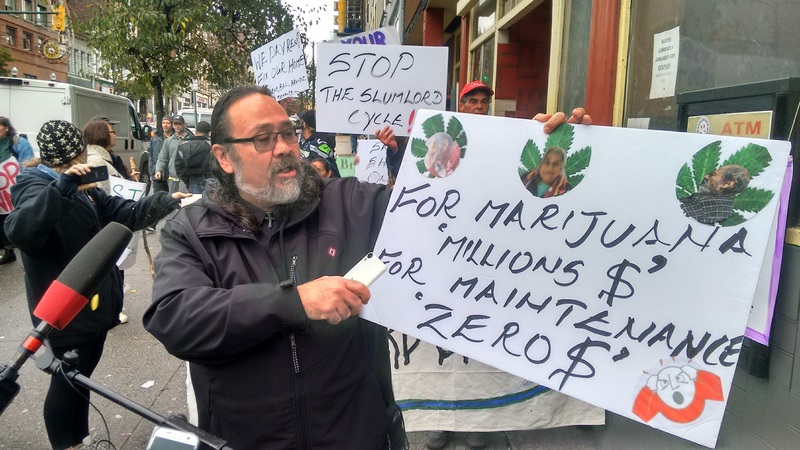 The focus of the picket line was directed at a landlord next door, Anna and Mario Ludicio, owners of the Brandiz Hotel, who are according to reliable sources attempting to lease the Regent from the Sahotas. Jay Slaunwhite who lives at the Balmoral across the street from the Regent and Brandiz, doesn’t want Brandiz management to take over the Regent either. “Ultimately I’m afraid the Brandiz owners might take over the Balmoral too. We are also putting pressure on the Sahotas and we don’t want them to think they can escape their responsibilities by leasing to another slumlord..” Well over 400 people live in the three hotels. See attached photos and click here for more photos of the Brandiz Hotel.